In her latest book, Dorinne S. Davis-Kalugin, an educational and rehabilitative audiologist with over 35 years experience, explains the differences between various sound therapies, how they work, and why they work. Why some therapies are more appropriate for certain listening and behavioral challenges than others. These sound therapies include Berard AIT (Auditory Integration Training), Tomatis®, The Fast ForWord ™ Series, The Listening Program™, Interactive Metronome®, Samonas™, Earobics™, and BioAcoustics™. The book has 4 sections. The first reviews the supporting scientific information. The second discusses the various sound therapies in use today. The third pulls all the information together and details the author’s "Tree of Sound Enhancement Therapy®" concept. And the book concludes with a chapter of personal successes and challenges presented in various cases. Dorinne S. Davis, MA, CC-A, FAAA is an educational and rehabilitative audiologist with 35 years experience. She is exceptionally qualified to explain these matters as she is the only audiologist in the U.S. trained and able to deliver the full range of sound therapies available to children with learning and behavioral challenges. Dorinne S. Davis is the President and Founder of Davis Centers, Inc. An educational and rehabilitative audiologist with 35+ years experience, Ms. Davis earned her bachelor's degree in Speech & Hearing and Speech & Drama, then her master's degree in Audiology/Deaf Education from Montclair State College in New Jersey. Now retired from her active practice, and spending time writing Dorinne is certified in Speech Correction, Pre-School Education, Speech & Drama, Teacher of the Hard of Hearing, and Supervision by the NJ Department of Education. She is a licensed audiologist in New Jersey, Pennsylvania, and New York. An international lecturer and author, Ms. Davis has received outstanding awards and honors, including recognition in over thirty Who's Who publications. She is also an active member of the American Speech-Language-Hearing Association, American Academy of Audiology, National Education Association, Educational Audiology Association, and the Association of International Berard Practitioners. In 1992, she receive her Auditory Integration Training directly from Dr. Guy Berard. She is a member of the AIT-PRO international forum. "No one can any longer deny the power of sound as fundamental and essential for a balanced life." ". . . your chapter concerning Auditory Integration is absolutely remarkable." Doris J. Rapp, MD, author of Is This Your Child's World? "Sound Bodies Through Sound Therapy is a fascinating and educational read written by an author who is well qualified to write a book about the differences between various sound therapies. Chapters 1 though 4: contain detailed information about the physics of sound, the body's reaction to sound, the auditory system and processes of this system. Factual and well written, this intricate information is presented in terms a layperson can easily understand. Chapters 5 through 7: introduce readers to the various methods of sound therapy, their creators, methods and case studies supporting the techniques. Chapter 8: describes the powers and uses of the voice. This chapter offers medically based, but an understandable introduction to the physiological functioning of the voice. This is an educational as well as interesting chapter. Chapter 9: discusses BioAcoustics, an explanation of, "This Signature Sound," of an individual and how our unique vocal frequencies affect us. Chapter 10: ties the various therapies and the physiology of our bodies together and how, "All of the physiological processes in the body are interlinked by a large number of interacting and crisscrossing pathways." Or, the how and why sound therapies and how they may stimulate the voice-ear-brain connections. 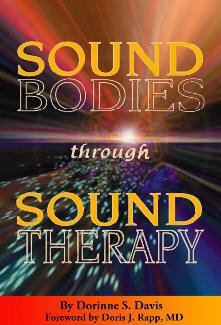 Chapter 11 relates real-life success stories of sound therapies. Although Sound Bodies Through Sound Therapy is a little off the beaten track and may be seen as interest to people involved in the field of medicine only, I found the book worthy of my reading/leisure time. Most certainly, Sound Bodies Through Sound Therapy will be of interest to any parent who has a child with symptoms or a diagnosis of autism, apraxia, ADD/ADHD, dyslexia, hyperlexia, Auditory Processing Disorder (CAPD or APD) or learning disorders."